I apply paint in layers using palette knives, brushes and oil sticks. I initially draw loose gestures and a variety of spontaneous marks. Often traces of previous layers remain visible, allowing colors to interact in ways I could not have anticipated. This process leaves me feeling quite lost a lot of the time, and I have had to learn to become comfortable with that feeling. This sometimes builds to frustration, and I will scape off much of what was applied, but the result of doing this is often something wonderful that moves the painting forward. 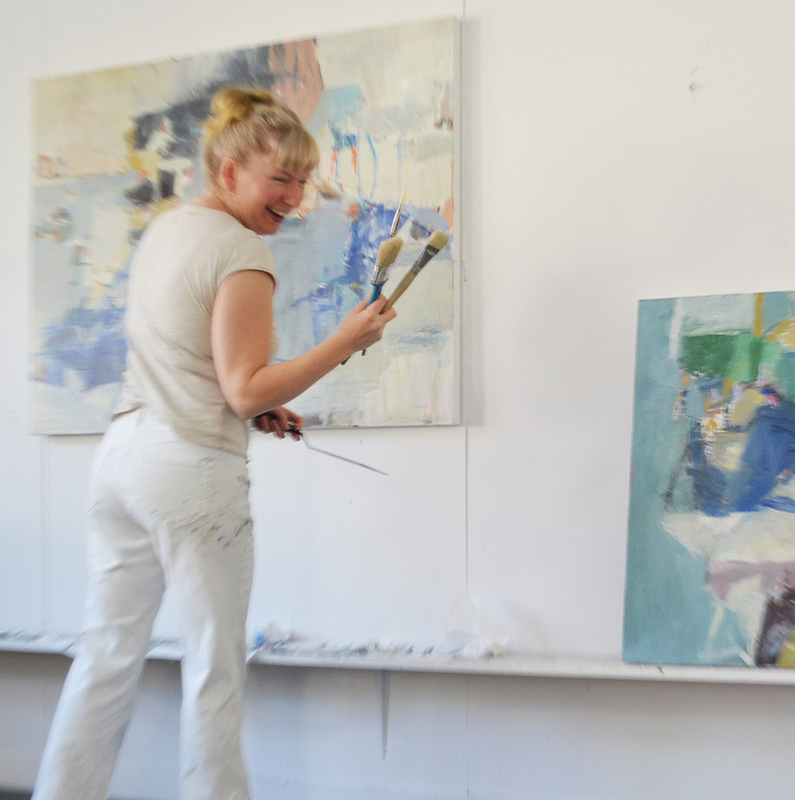 I view the painting process as a collaboration between myself and the materials. A conversation starts that has a beginning and an end, but everything in between is unpredictable. It seems at first some exciting things may show up but it’s important to disregard these first, too beautiful bursts, work over them, and develop something deeper from them. As the painting evolves, shapes and lines solidify, and I begin to see how the parts affect the whole. This way of layering, adding and subtracting, creates a history on the canvas. Shapes have a story to tell. Lines that have been obliterated and resurrected over and over again have an emotional charge. This process that started as a wild party ends up as a contemplative carefully edited composition, involving precise modifications, while hopefully leaving the life force in tact. Jenny Nelson attended Maine College of Art in Portland Maine, and is a graduate of Bard College, where she received a scholarship to the Lacoste School of the Arts in France. She has been living in Woodstock, New York for nearly two decades, including a Residency at the Byrdcliffe Art Colony from November 2004-08. Jenny has been exhibiting for many years nationally and regionally including, Tria Gallery, Manhattan, NY; Hidell Brooks Gallery in Charlotte, North Carolina; Carrie Haddad, Hudson, NY.